Pre Event Workshop 2 on 11th March 2018. Aakaar, IIT Bombay in association with Bentley Systems brings you a complete workshop on CONTEXT CAPTURE and MICROSTATION, Reality Modelling Softwares which involves in designing a Model, document and visualize infrastructure projects of any type, scale, and complexity, with a comprehensive set of design and documentation capabilities to reliably deliver even the most demanding projects. Mark your calendars for the 2nd Pre-Event of AAKAAR’18 on 11th March 2018 (i.e Sunday). 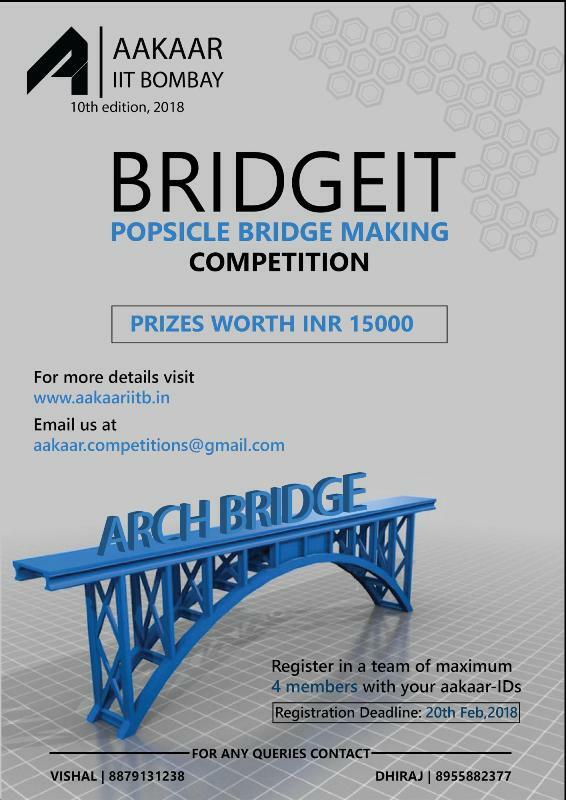 BridgeIt: BridgeIt is the competition in which participants have to make a Trussed Arch Bridge using Popsicle sticks and Fevicol as adhesive. Designing Bridge for the hilly area is very challenging as land is too much undulated therefore designing of the bridge with footings at different levels is required for such areas. 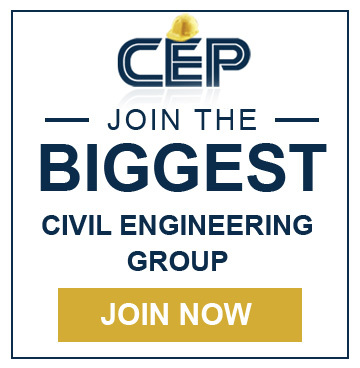 Thus we are launching the competition to make Trussed Arch Bridge with different level of footings that can sustain the greatest conceivable load without failure. 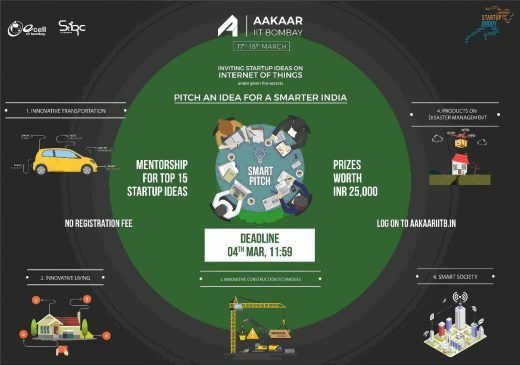 Prizes worth INR 15000 at stake. 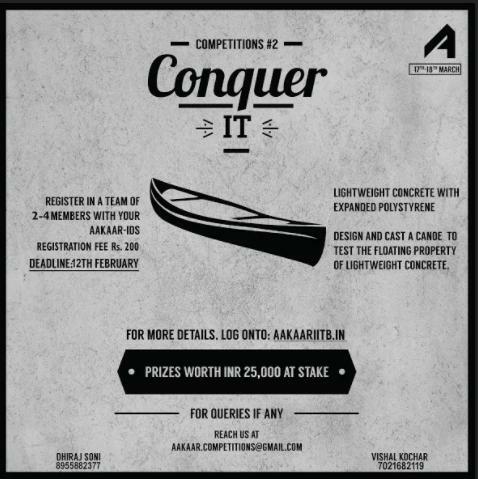 ConquerIt: conquerIt is the competitions in which participants have to make mini canoe using Expanded Polystyrene (EPS) Concrete. Expanded Polystyrene (EPS) Concrete is one of the forms of lightweight concrete. It has advantages such as increased thermal and sound insulation properties, easy shaping and ability to be formed by hand with sculpturing and construction tools. 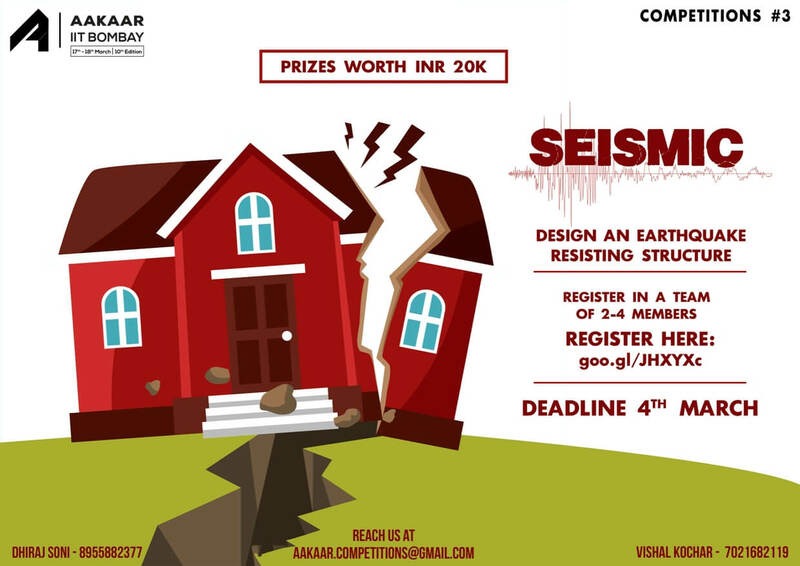 Prizes worth INR 25000 at stake. 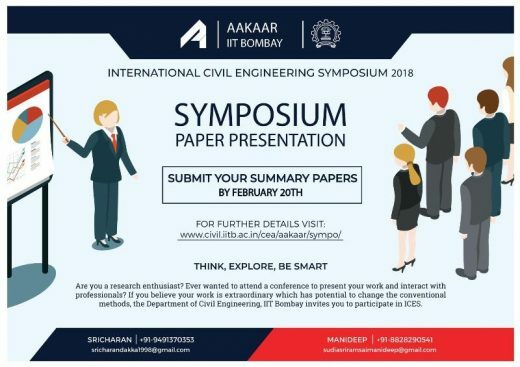 International Civil Engineering Symposium IIT Bombay was launched with the prime motive of encouraging research enthusiasts in the field of Civil Engineering to engage in vigorous research and take Civil Engineering to a whole new level. 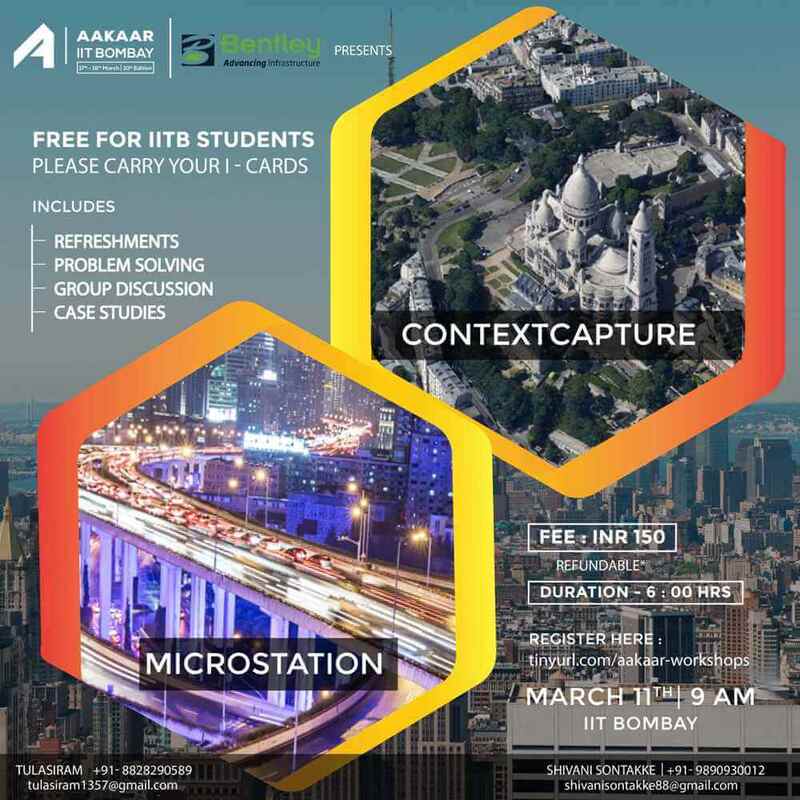 If you are a research enthusiast and you feel that your research paper has got something extraordinary, Aakaar’s ICES IIT Bombay is a platform to showcase your talent in front of eminent professors, industrial professionals and talented students in a formal conference. 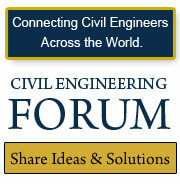 Summary papers are invited in different civil engineering disciplines on the theme of ‘Innovation in Civil Engineering and Smart Infrastructure’. 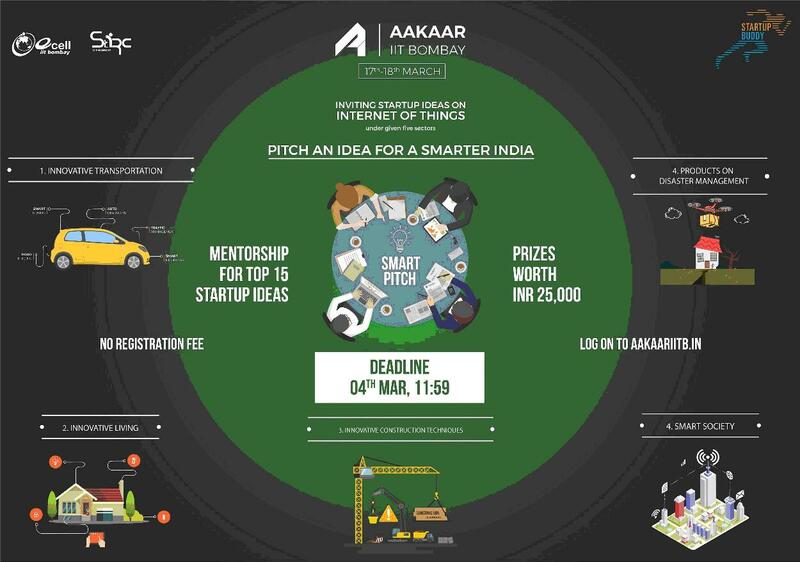 Prizes worth INR 30,000 at stake. Poster Presentation:Technical poster presentation is the presentation of research information or an idea with an academic or professional focus on a poster. For any professional, communicating his/her idea efficiently determines his success professionally. The primary motive of this competition is to enhance the ability of delivering a visual presentation without any other audio/video aids. 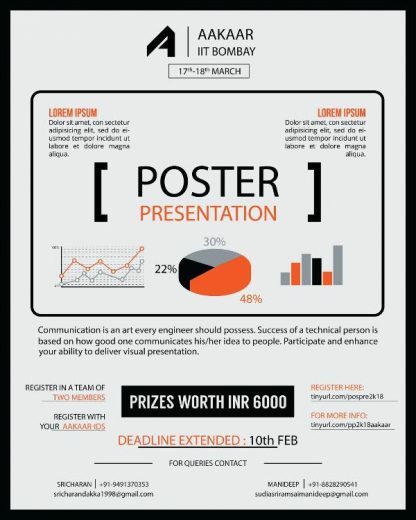 Prizes worth INR 6000 at stake. 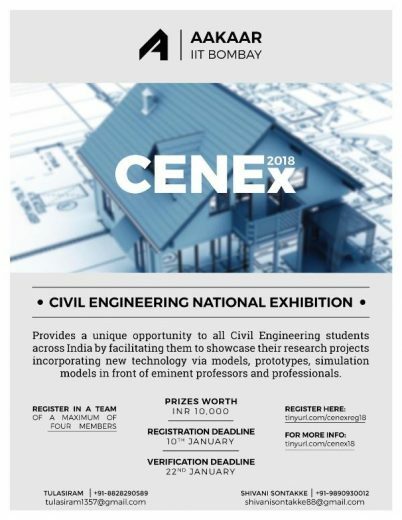 Civil Engineering National Exhibition, CENEx which provides a unique opportunity to all civil engineering students across India by facilitating them to showcase their research projects incorporating new technology via different models, prototypes, simulation models in front of eminent professors and professionals. CENEx is a platform which invites all students to establish a link which connects their research with the practical world. 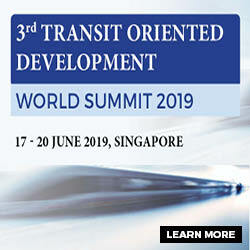 Eminent personalities from civil engineering, lecturers, and industrialists will be the part of this event. Aakaar aims to develop practical skills in a wide range of fields through its plethora of highly sought after workshops. With the best technical experts and interaction with students sharing common interest workshops will help you to delve deeper into subject. This year we had a pre-fest workshop on Staad Pro. 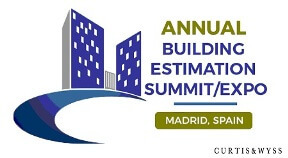 During AAKAAR, workshops on ETABs and BIM(Building Information Modelling) will be conducted. Over the past three decades, Mechanically Stabilized Earth (MSE) retaining walls have been increasingly used as design alternatives to traditional reinforced concrete retaining walls for supporting earth fills in civil infrastructure projects. 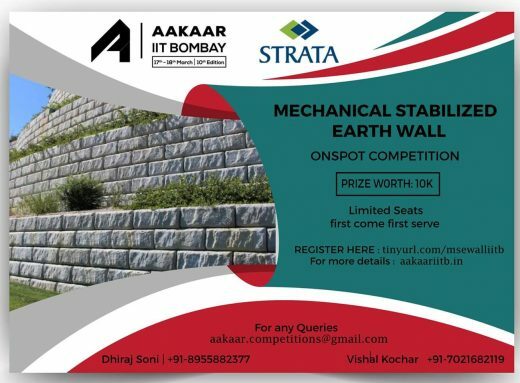 Aakaar, IIT Bombay in association with Strata Geosystems presents a unique first come first serve based on spot competition on MSE walls. 3.Mohan V.Jatkar,Executive Technical Director,Gammon India Ltd.
4.Alpa Sheth,Managing Director,VMS Consultants Pvt Ltd.
Aakaar, The annual technical fest of the Department of Civil Engineering, IIT Bombay.